With thousands of templates and limitless customization options, you can create the perfect brochure in just minutes. Easy to use, even with no design experience! For most people, making an effective brochure has meant spending big money on a professional designer or devoting hours to mind-boggling, maze-like design software. But MyCreativeShop changes that—making it easy for anyone, anywhere, to create professional, print-ready brochures in minutes. In a single online editor, MyCreativeShop gives you all the tools you need to create a stunning brochure with no design experience. Choose from an amazing variety of templates, icons, patterns, and fonts, and then further customize your design by uploading your own imagery and text. You'll be able to add, delete, move, rotate, resize, reshape...all right from your browser. When design got complicated, we made it easy. 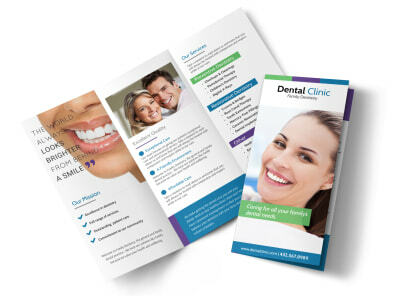 As soon as you’re happy with your brochure, it’s ready to be shown to the world! Share your brochure online, save a PDF to print anywhere, or order high-quality prints directly through us. With virtually endless customizations and a simple, user-friendly interface, we make the creative process so much easier than the other sites you’ve used. You’ll get a polished, professional-looking brochure, and no one will know you made it yourself! Conveniently search thousands of brochure templates by category or topic, or browse on your own until inspiration strikes. For those with design experience, we also offer blank brochure templates in several popular sizes and layouts. Find your brochure now. Our templates come with high-quality photos relevant to a variety of industries: real estate, hospitality, travel, and more. Keep these pre-set images, replace them with another from our varied selection, or upload a photo of your smiling staff directly from Facebook, Instagram, or your device. Complement your eye-catching imagery with details about your product, service, or special offer. Write an attention-grabbing header and fill in all the information your readers need to take immediate action. Because we have placeholder text boxes ready to go, it’s easy to choose stylish and legible text. 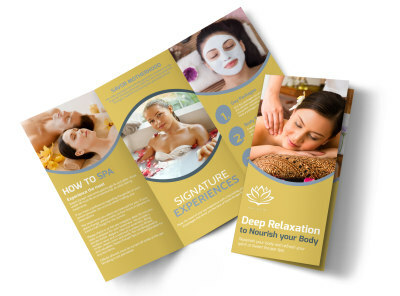 Our brochure templates have been designed for visual appeal and clarity, but they’re also made for easy customization. All it takes is a few clicks to change the background color or pattern, rearrange or delete sections, add new icons and shapes, and more. As soon as you’re done designing in our online editor, you really are done—no waiting around! You can immediately download a PDF file (to display on your website or have printed anywhere), share your brochure on social media, or order premium prints from us. 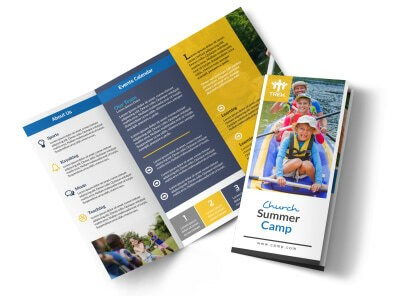 Creating a unique brochure couldn't be easier. From brochure size and fold to images, fonts, and icons, our online editor puts you in control—with just as much guidance as you need. From business owners to volunteers, MyCreativeShop is made for busy people who wear many hats. You may not have tons of time, budget, or design experience, but you can still get the high-quality, professional brochure you deserve. Through our user-friendly online editor, anyone, anywhere, can create a stunning brochure in next to no time. We let you build exactly what you need at your own pace. No learning curve, no software to download, and no design experience necessary. Discover why so many people who have tried other websites call MyCreativeShop the best website for creating brochures. Start designing now! What can I do with my brochure? Receive your brochure as a PDF file to print in your own office or at your favorite local print shop. Order between 50 and 50,000 brochures directly through us. Clients love our high-quality paper and fast shipping! Get a web-ready image or custom url of your brochure and easily share your design on any social network or website. It’s fast and easy to show off your brochure. Your brochure will be saved to your project library, making it painless to make changes in the future. Log in to make design tweaks, or reorder the same print with just a few clicks.